Are you interested in learning more about climate change and how cities like Burlington can take action? 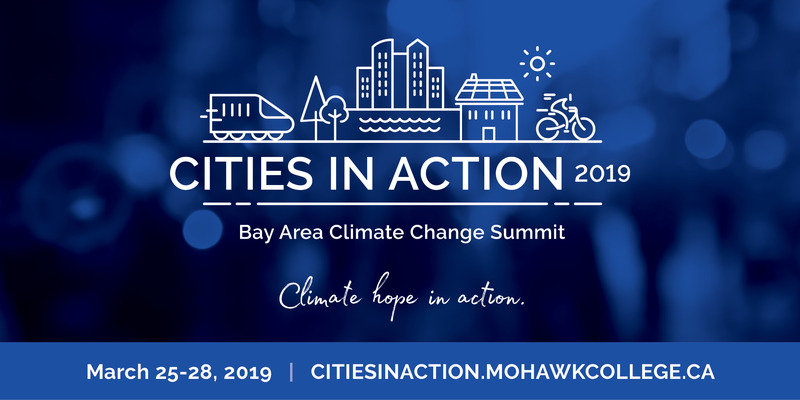 If yes, then you should consider attending the Cities in Action – Bay Area Climate Change Summit taking place from March 25 to 28, 2019 at the Royal Botanical Gardens in Burlington. You can attend one, two or three days. The summit will be launched on the evening of Monday March 25 with a free public event. Community leaders will talk about actions their organizations are taking to tackle climate change. There will be something for everyone at the summit: presentations and panel discussions related to business and the economy, transportation, energy and community resilience. Be inspired to take action at home, work and in the community. Highlights are provided below but more details can be found at https://citiesinaction.mohawkcollege.ca. Come and learn how leading cities are taking action on climate change – in Canada and around the world. The keynote speaker is Sweden’s Åsa Karlsson Björkmarker. Åsa is Chair of ICLEI Europe and the former Deputy Mayor of Växjö, a Swedish city awarded ‘Greenest City in Europe’. Åsa will be talking about how European cities are addressing climate change, striving to be carbon neutral and implementing innovative adaptive technologies. Over 80 per cent of Canadians live in urban areas. Cities are the greatest consumers of energy and have some of the greatest opportunities to impact climate change. Participants on day two will learn about action being taken in Hamilton, Burlington and beyond to transition to low carbon, resilient cities for today and future generations. Our mobility options within and between our cities can have a profound impact on our greenhouse gas emissions, our health and our economy. Day three features the Bay Area Transportation Forum, showcasing transportation solutions of today and tomorrow: current realities and future possibilities. The Bay Area Climate Change Summit is a collaboration between the Centre for Climate Change Management at Mohawk College and the Bay Area Climate Change Office (including the Cities of Burlington and Hamilton), the McMaster Centre for Climate Change, and Sustainable Hamilton Burlington. Inside, Åsa Karlsson Björkmarker, Chair of ICLEI Europe, from Sweden was supposed to share stories of how Europe’s cities are taking action. She spent maybe 10 minutes on that will one barely visible slide from 6 cities. Most of her talk was about climate justice: the poor are already paying dearly for the pollution caused by the lifestyules of the rich (that would be us). She said there are fundamental problems with BAU: inequity, denial, privilege, distorted tax regimes, etc. that have to be addressed if there is going to be buy-in from ‘the people’. She explained the gilets jaunes movement in France as grounded in rural-urban inequality in sharing the national resources. Advice for us locally: cities are indeed where action can happen first and fastest. Cities need to foster political unit (benefit is no party system at municipal level), cultivate longterm goals, majority view needs to be very ‘generous’ topwards the minorities, and needs to trust the opposition, make room for them to implement their priorities. She counselled look towards what makes our city unique and build with that, eg waterfront, waterfalls, steelmills, escarpment. STart fixing the ‘low hanging fruit’ related to climate/carbon pollution. Collaborate with the willing, don’t wait for the rest.